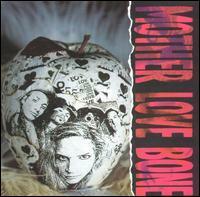 Apple is the only full-length studio album by the American rock band Mother Love Bone. It was released on July 19, 1990 through Stardog/Mercury Records. In September 1989, the group returned to the studio to record its debut album Apple with producer Terry Date at The Plant recording studio in Sausalito, California. The band finished the album in November 1989 at London Bridge Studios in Seattle, Washington. Compared with the band's debut EP, Shine, vocalist Andrew Wood's vocal stylings are more mature, drawing heavily upon similar techniques of guitarist and singer Marc Bolan. "Crown of Thorns" originally appeared on Shine, however on Apple the song is missing the opening "Chloe Dancer". The album was mixed by Tim Palmer. The album's cover art was photographed by Lance Mercer. Despite some initial difficulties, the record was on-time for its projected March 1990 release. By early 1990 interest in the band had hit a fever pitch and it seemed destined that the band was going to make it big. Only days before Apple was slated to be released, however, Wood overdosed on heroin. After spending a few days in the hospital in a coma, Wood died, effectively bringing Mother Love Bone to an end. The album would see release later that year in July. The album eventually charted at number 34 on Billboard's Top Heatseekers chart in 1992. Kim Neely of Rolling Stone said that the album "succeeds where countless other hard-rock albums have failed, capturing the essence of what made Zep immortal – dynamics, kids! – and giving it a unique Nineties spin." A music video was made for the song "Stardog Champion". The entire album later appeared on the 1992 compilation album, Mother Love Bone (also known as Stardog Champion). It was also remastered and reissued on September 8, 2003 by the UK-based Lemon Recordings.